They consider fast bowling to be the most difficult art in cricket. This is the reason we have had only 25-30 genuine fast bowlers in the history of cricket. Charlie Griffith, Fred Trueman, Malcolm Marshall, Andy Roberts, Michael Holding, Dennis Lillee, Jeff Thomson, Shoaib Akhtar, Brett Lee, and others are few examples. All of them bowled consistently at a speed of 150 km per hour and demoralized the batsmen with their bouncers, swing, and yorkers. I have heard and read several interviews of the greats like Sunil Gavaskar, Vivian Richards, Rahul Dravid, and others. None of them liked to face fast bowling. Who likes to be hit on their ribs or have their fingers fractured? I guess no one, and there lies the importance of fast bowling. The name Wasim Akram evokes a feeling of awe, respect, and admiration in my mind. He had the simplest bowling action, and yet delivered most difficult deliveries to the batsmen. I watched him bowl for the first time when Pakistan toured India in 1986-87. He was new to Test cricket, having made his debut in 1985. Akram bowled to Sunil Gavaskar, Srikkanth and Vengsarkar as if he was a veteran bowler. He consistently bowled bouncers, in-swingers and targeted the ribs and abdomen area of these great batsmen. Apart from Gavaskar, all of them found it difficult to negotiate his deliveries. He took 13 wickets in the series. When he started out, he bowled with a longer run-up. His uniqueness lied in the quick arm action which added to the misery of the greatest of batsmen. As the time progressed, Akram grew from strength to strength, and I followed his career closely. In the early 1990s, he blossomed into a genuine fast bowler with the swing, seam, pace, and variations in his arsenal. Pakistan won the 1992 World Cup, and Imran Khan got all the accolades. But this would not have been possible without the great bowling of Akram. He produced three magical deliveries to bowl out Allan Lamb, Chris Lewis, and Ian Botham. 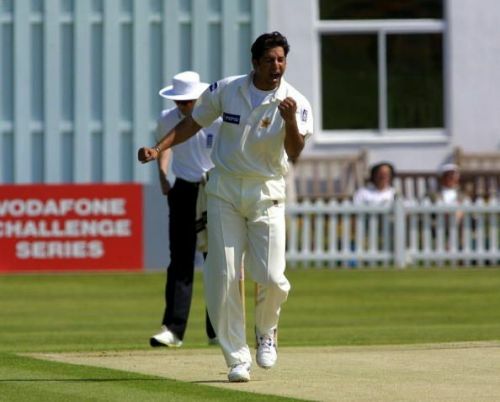 Akram played 104 Test matches and took 414 wickets. He was useful with the bat too, scoring 2898 runs. In the ODIs, he took 502 wickets. The greatness of Akram does not lie in the statistics, but the way he carried forward the legacy of fast bowling. Waqar Younis ably supported him in this journey.